Until a sample of Providence Perfume Co Bay Rum cologne showed up in my mailbox, I’d been vaguely curious about Bay Rum colognes, but not enough to track one down. I’d seen darling straw-thatched bottles of Bay Rum in hat stores by the cash register and the odd retro-looking bottle at a family-owned drugstore. But I couldn’t tell you what Bay Rum smelled like. Well, now I can. And I like it. According to Wikipedia, Bay Rum cologne is a West Indies cologne, probably originating in Saint Thomas, made from rum, the leaves and berries of the West Indian bay tree (not the culinary bay you might be more familiar with), and spices such as clove and cinnamon. In short, it’s a warm, spicy scent that lovers of linear, spicy fragrances along the lines of L’Artisan Parfumeur Tea for Two and Laura Mercier Minuit Enchanté might want to investigate. Pinaud Bay Rum’s label proclaims it’s “formulated with a unique blend of Essence of Bay Tree and Exotic Spices.” Clove and cinnamon are definitely among these “exotic” spices, and I detect a dash of lime, too, giving it a slightly manly feel. Mostly, though, I get musk. It’s not an overly soapy musk, but it’s clean. Mingled with clove and cinnamon, it’s also comfortingly grandfatherly. Pinaud Bay Rum fades quickly, just as it should, and leaves a bare but definite wash of musky spice behind. After an hour or so, it’s gone. For the right person, Pinaud Bay Rum would be a terrific cheap thrill. Providence Perfume Co Bay Rum cologne classes up the one-two punch of bay and spice to create a fragrance more substantial and complex than Pinaud Bay Rum. Its notes include local rum (local to Providence, Rhode Island, that is), lime, allspice, sea spray, bay, jasmine and ylang ylang. Maybe it’s the illusion of the other notes or the suggestive illustrations of ships that adorn Bay Rum bottles, but I almost smell a lemon-wax-polished wood deck under the fragrance’s soft spice. The fragrance is crisp and doesn't carry any of Pinaud Bay Rum's musk. The Providence Perfume Co Bay Rum wears more like perfume than like an all-purpose cologne. It’s fairly linear but rich, and it’s not something I’d freshen up with if I thought I’d be applying another fragrance later. It would obliterate most delicate perfumes and scare up a real olfactory ruckus with assertive but girly fragrances. If I didn’t already own a few spicy perfumes I love, I could see adding a bottle of Providence Perfume Co Bay Rum to my collection. The price is right, and you can truly smell the quality. Mostly, though, I’d like some of those flagrant fougère wearers to hang up their Brut and start thinking old school. Like Bay Rum. Pinaud Clubman Virgin Island Bay Rum is $7.99 for a 177 ml splash bottle and can be found online and at drugstores. Providence Perfume Co Bay Rum Cologne is $65 for a 100 ml splash. For information on where to buy it, see Providence Perfume Co under Perfume Houses. We have a bay and a lemon bay growing in our yard. theya re beautiful and just crushing the leaves smells like the Pinaud cologne. The lemons smells like spicy lemon verbena. There was a Czech and Speake bay rum scent, but I don’t remember the name or much else about it. I forgot to thank you for the review–I am going to have to get a sample of the Providence one. I love the scent of bay, but I don’t have West Indian bay (of course). Still, whenever I’m in the yard, I can’t help but crush a leaf in my fingers. What great memories it must bring! I can imagine how deliciously pungent the shop smelled. It wasn’t really even a shop, not like a tourist place or anything. It was the actual place they made bay rum oil. And when I say tapped out of a barrel I mean that literally, a big metal oil type barrel sitting on a dirt floor. And the space was so pungent I don’t think I’d be able to work there! The St Thomas version of LUSH LOL It was a wonderful treat to visit and I remember them being really happy someone was so interested in the raw process. I think that’s the only reason I was able to get a bottle of the stuff at such a high concentrate, it wasn’t normally for sale there. That is very cool! You were at the bay rum factory itself! That is awesome! I would cherish such a bottle of bay rum concentrate! Dominica Bay Rum is also worth checking out. They used to have one with a cologne strength, but now it is only available as an after shave. However, a good bay rum is supposed to be light. More expensive than the Pinaud, it is still pretty cheap. Thanks for the recommendation! I can’t believe I never investigated Bay Rum until now. I love spicy scents. Glad you reviewed these. I’ve never tried to track down bay rum because I thought it would smell like culinary bay leaf – now I’m curious to try it. I was surprised, too. Really, it’s just a bracing spice. Bay Rum is synonymous with my grandfather to me. He was an old school man’s man – hard drinking, tough talking, outdoorsman – who was absolutely putty in his womens’ hands. I adored him completely. 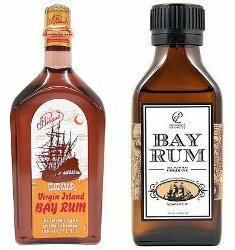 I’ve never known anyone else who wore Bay Rum, but I wish someone in my immediate environment would take it up. I have no idea what brand he wore, but I can remember seeing the splash bottle on the shelf in his bathroom next to his shaving kit. I love your description of your grandfather! It sounds like you need to track down some Bay Rum simply for the memories. It’s always interesting to revisit fragrance we used to love, back in the day when having–gasp!–three perfumes would have felt extravagant. I love Bay Rum fragrances, and I’ve owned several brands. I haven’t tried Pinaud in years, but I do remember it being a good cheap thrill. I would not taint my bay rum with white flowers, though. You really can’t tell there’s any jasmine or ylang ylang in the Providence Bay Rum–they blend nicely. But I know what you mean! The principle of it! My dad wears Royall Bay Rum aftershave as did his father, its a lovely masculine scent, a real Man’s Man smell as previously described but for an older man, “grandfatherly” is probably appropriate as my grandfather wore it and my father is a grandfather now. The Royall brand, to me, is more flamboyant than other types of Bay Rum, my grandfather was Latin, raised in panama, a former professional tango dancer, in his old age he was very found of all white suits, with his natural good looks and thick black hair that never did become thin but turned a handsome silver, he looked like Ricardo Montalban. My dad is more reserved but he too has magnificent hair and is prone to wearing traditional Cuban guayaberas. Bay Rum was supposedly a scent inspired by the sailors of South America who would soak bay leaves and berries in rum and then pour the mixture diluted with cool water over their tired achy bodies after a day of unloading cargo at the docks. Bay rum is what they ended up smelling like afterwards and it was a considered a cheap form of sailors cologne. I don’t know if that’s true or just ad copy but my family comes from a long line of sailors so my romantic side wants to believe it is. In any case, I’ve never been able to wear it, too masculine for me, but my mom loves it on him and I know that I will keep a bottle around for the rest of my life to remind me of the men in my family. Perhaps in the future I will soak cotton balls in it and put it in drawer sashays or just unscrew the pretty crown bottle top and take a whiff of memories. What amazing stories! I love your descriptions of the men in your family, and I love how you think about Bay Rum’s history. Thank you so much for these wonderful stories! I wish I could have met your grandfather. At the Bentonville AR 21c museumhotel, the toiletries were malin + goetz. The body wash and soap were Rum-scented. I thought they were good. The line also offers a cologne but I haven’t sought it out as I read somewhere that it smelled like all the synthetic parts combined. “All the synthetic parts combined” does not sound like much of an alluring cologne! I can see why you’d avoid it. Thank you so much, Angela, for putting the spotlight on Bay Rum! I wish that more people, male and female, would wear it. Tomorrow, this middle-aged woman is going to smell like someone’s (dashing) Grandpa! Ha! The Providence version is certainly unisex, and I bet some of the others are, too. More power to you! Pinaud in PLASTIC now! A shame! Cheap plastic, too! I can tell that it used to be a handsome glass flask, though. Indian bay leaves ( I cook with them) are different from our traditional bay laurel leaves. They are larger and smell a little like cinnamon. These are very likely the “bay” in Bay Rum. They sound delicious and like a perfect component to Bay Rum!